Here is all the information on Jack Higgins himself. Jack Higgins is, like James Graham, Martin Fallon and Hugh Marlowe, a round and pseudonym for his real name: Harry Patterson. Jack Higgins is nowadays a multi-millionaire who lives on Jersey (one of the Channel Islands) with his wife. Jack Higgins was born July 27th 1929 and raised in Belfast in a family with a political background and frequently experienced the worst aspect of the troubles during his youth. He later moved to Leeds, left school with no qualification at an early age and had a succession of jobs, including two years as an NCO in the Royal House of Guards serving on the East German border during the Cold War. He was then accepted as an external student at London University while working as a circus tent-hand, a tram conductor and most things in between, and a degree in sociology took him into teaching before he became a full-time author. He was already a writer of adventure stories when he, in his forties, wrote "The eagle has landed" but this highly original war novel turned him into an international bestselling author. His novels have been translated into more than forty languages. He is also the Patron of the Jersey Film Society. He now holds a honorary award at Leeds Metropolitan university and is a professor a Manchester University. There are some interviews online: Interviews with Jack Higgins. Allan Skertchly wrote his own, detailed biography enriched with his own memories of Jack Higgins. It's worth reading. A fan meets Jack and reports to us: Meeting Jack Higgins at a fundraising. Thanks to Shawn Sweeney I have now a picture of an autograph of Jack Higgins. 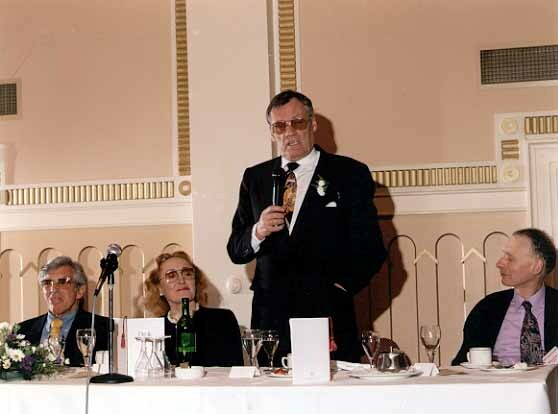 A picture showing Jack Higgins speaking in public the the Leeds Tapestry.